I think watching Nancy Drew (the Emma Roberts one) too many times got me fixated on loafers. In the movie Nancy says, "Penny loafers are practical." I got thinking about penny loafers and the style of shoe that seems to be popping up from every brand. Although loafers are practical shoes there's more to them.They're clean and modest and a bit androgynous. Personally, they are a nice in between when I don't want to wear birkenstocks, classic Vans, or chelsea boots (which I tend to wear a bit too much). When I was browsing Urban Outfitters, I found a beautiful black pair of loafers Bianca Leather Loafers originally $69. I was hoping to find this pair in D.C. but they didn't have them in store, fortunately they shipped them to me and the pair was only $20?!? Styling loafers with cool and cute socks is a must. One of my favorite places for a cute pair is M Taylor Gifts. M Taylor Gifts is owned by Marilyn Taylor, a K-State graduate. Yay for alum! Marilyn sells beautiful and unique accessories. She considers her store partially an art fair, partially a gift boutique, but overall stocks unique gifts. 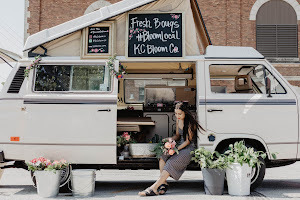 Although her store is traditionally online she has merchandise at Hawthorne 109 in the historic City Market in KC in collaboration with other local businesses along with her online store. 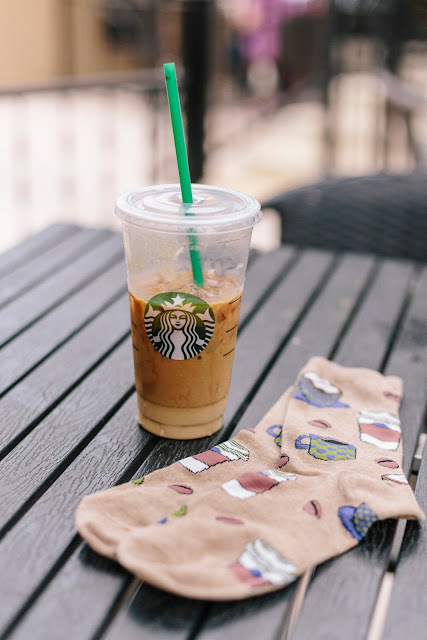 This pair is called Love You a Latte from M Taylor Gifts. I am usually not a brown sock with black shoes kind of lady but this pair is life changing! I love that this pair isn't knee high. They work throughout the fall-spring season! I like them best with a light to mid wash of jeans with a bit of a cuff. 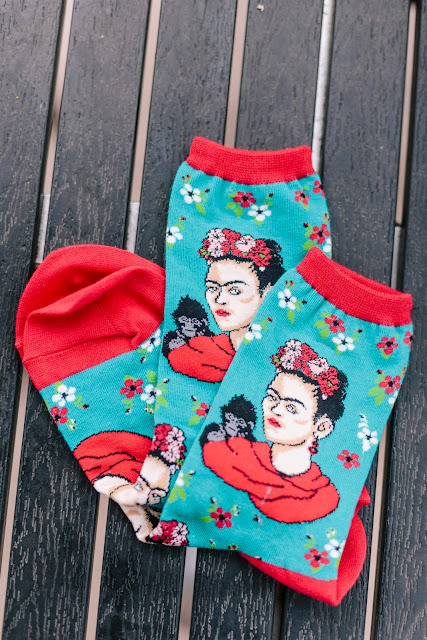 These Frida socks are my second favorite pair from M Taylor Gifts. I think I'll wear this pair with a more minimalistic white blouse and jeans. I'm sure I'll find some crazy Man Repeller like looks and I'll be sure to update on my Instagram Story! M Taylor Gifts has so many fun and unique picks for gifts. 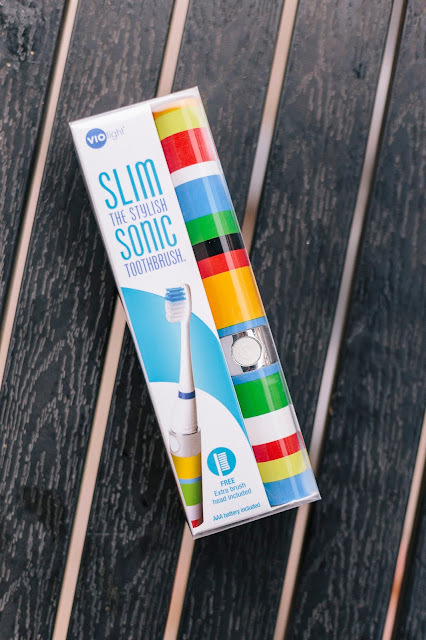 One of my favorites is her SLIM Sonic Toothbrush in Stripe. Since I travel domestically fairly frequently the last thing I remember to bring is a toothbrush but how can I forget this SLIM Sonic Toothbrush - Stripe?! This toothbrush is for real, it has a triple A battery and an extra head! Its $15 but in my opinion its a steal. 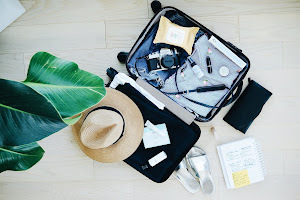 No one likes a long day of traveling to realize they forgot a toothbrush and have to rush out to a drug store. Plus this Toothbrush fits perfectly in any size make up bag! I received these products complimentary from M Taylor Gifts for testing purposes. All opinions are always my own. 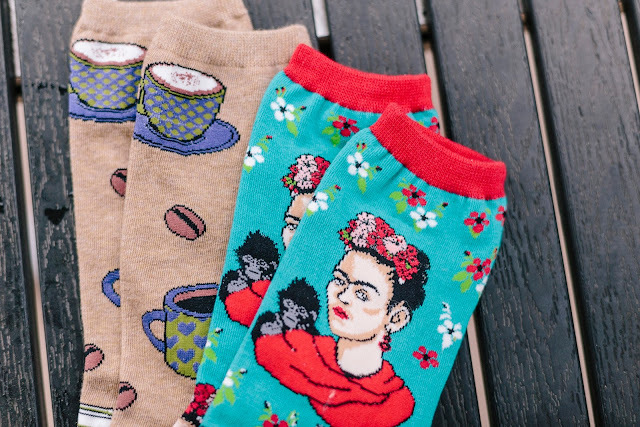 I love these cute socks- I need to take this trend for a test drive! Wow love those socks so unique. Thanks Rumela, they're pretty awesome! These are cute and you rock them with those shoes! Thanks Courtney! 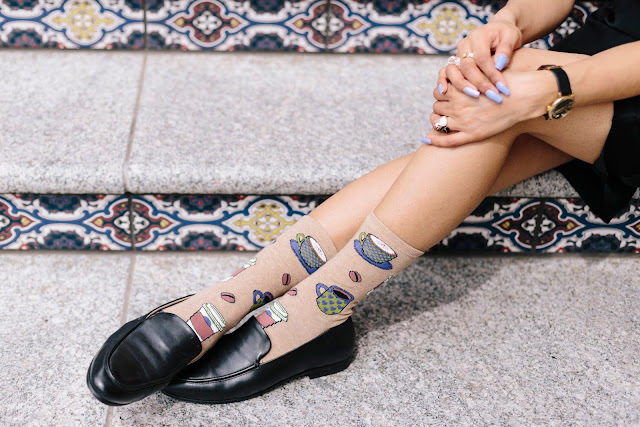 Loafers and socks just seem like the perfect match! Thanks Marisa! I know right?! Aren't they awesome?! 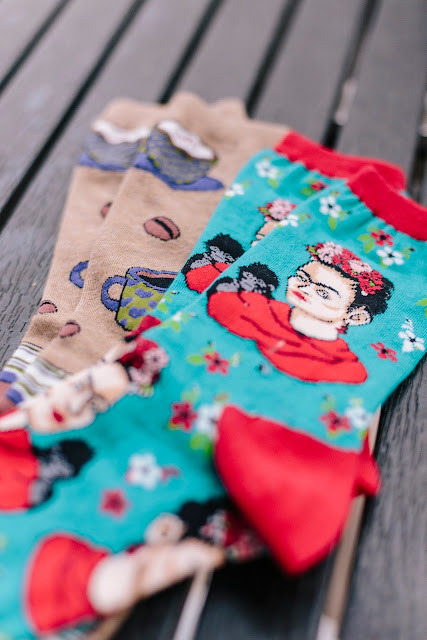 These socks are so cute and they look really cool with these loafers! I love loafers too, they're so chic and comfy as you've mentioned and I love that they've been trending so much these past couple of seasons; we've been seeing so many cute options as a result! 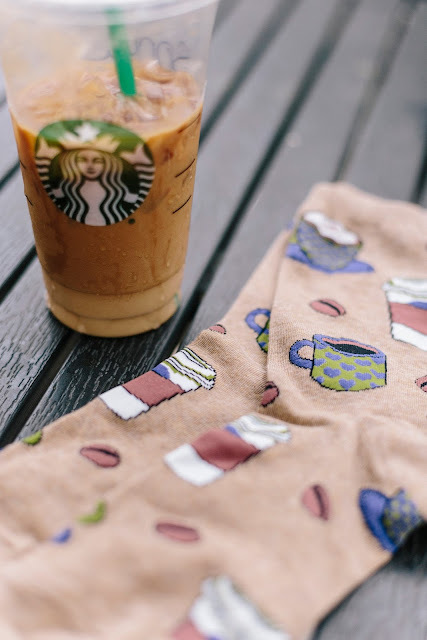 I love these cute socks, the designs are too cute and will add the perfect personal touch to any outfit, how awesome that they're made by a fellow alum!? Thanks for sharing and I hope you're having a wonderful start to your week so far, beauty! Thanks Jalisa, I'm really loving this trend. Hope you're having a great weekend! Oh I totally love your socks. They are so original and fun. So fun! Love how cute they are with your loafers. Thanks Amy Ann, love these loafers! 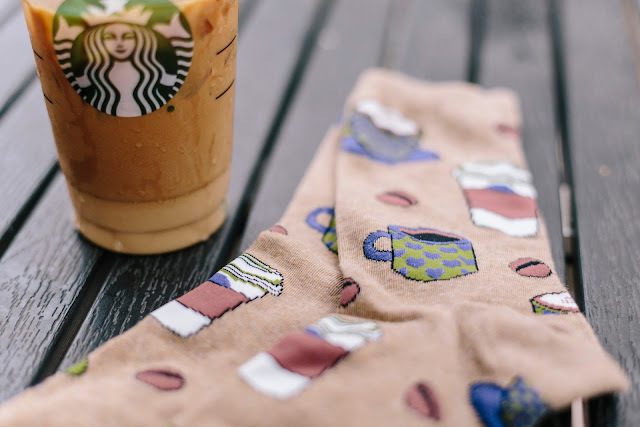 Those coffee socks are seriously adorable and fun. Great loafers and the socks are so cute! 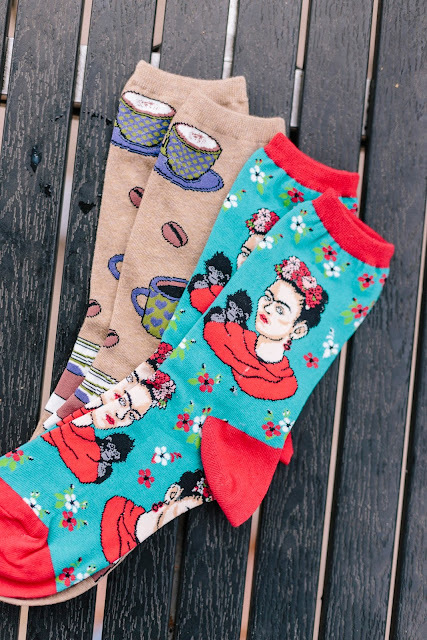 Those socks are so fun--I love the Frida pair! I keep seeing cute loafers around too and I think I need to find a pair. I don't think I've been to M Taylor gifts, but I need to check it out, especially since she's a K-State grad! I think you should get a pair of loafers and definitely check out M Taylor Gifts! Hope you're having a great weekend! I've never been much of a socks girl, but I'm changing my ways! That pair sounds awesome I might need them too!